A small box with its effects derived from Little deFormer 2. Its input can be switched between line level and hi-z (guitar). It has a monophonic sampler, that can hold a maximum of 127 samples/10 minutes. Tune, start point and sample select (selects any of its 127 samples) can be modulated. Samples are held in internal FLASH memory, so they are kept after a power-off, and they are immediately available after a power-on, without any loading times. Samples can be played back chromatically over a 2 octave range, via a connected MIDI keyboard. Samples can be recorded from its audio input or imported as wav files, with the USB box connected. Samples can also be exported as wav files, through the USB box, and presets can be backed up. A distortion effect that works on the audio input and on the sampler are also available, with 4 different types. Most of the distortion parameters can be modulated. 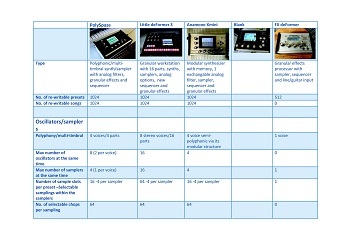 A filter with 8 different types, cutoff, resonance and 3 filter adjust setting, that can be inserted on the audio input, the sampler or inside the granular effect are available. Most of the filter parameters can be modulated. The main part of FX deFormer are its granular effects. It has 2 reverb types, 2 delay types, 2 glitch shifter types, pitch shaper, sample pitch, variator, time stretch, abstructo, granulator and chorus. 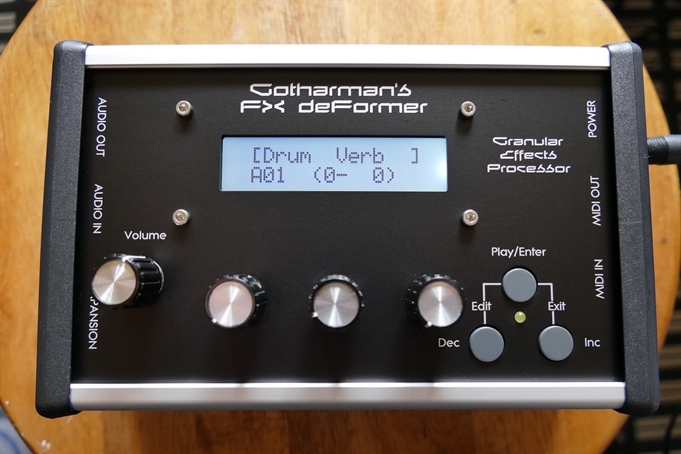 Many of these effects are Gotharman specialities, that you can only get in a deFormer, and even the more traditional effect types, like reverb and delay, has granular parameters and "depth" controls. One of these effects can be selected at a time, and up to 4 parameters can be modulated. It has a simple 4 track, 16 step, step sequencer. One track can select any of its max 127 samples, another can control the sample start point, the third can control the sample pitch, and the fourth are a modulation source, that can modulate most of FX deFormers parameters. The sequencer can sync to MIDI clock, output MIDI clock, and sync to analog gear via a connected AnaX expansion box. Modulation sources counts 4 LFO's, 2 of the sequencer tracks, 4 CV sources (with AnaX mkII connected), and 6 MIDI CC's. All your setting can be stored and held in 512 preset locations. FX deFormer can be updated via MIDI. The Play/Enter button can trigger a sampling, start/stop sample playback, start/stop the sequencer or function as a bypass switch. All user settable. -Holds up to 512 user re-writable presets (not all presets are pre-programmed). Each preset holds all settings for input level, the sampler, the sequencer, the filter, the distortion, the granular effects section and the expansion box (if any connected). Global settings for MIDI channel, sync and line/hi-z switch, are stored separately each time they are changed, and are global for all presets. -Number of tracks: 4. Track1 : Sample select, track2 : Sample startpoint (and modulation source), track3 : sample pitch, track 4 : modulation source. -Recording method: Inputting 16 step values for each track, via knobs and display. -Resolution: Adjustable to 1/32, 1/24, 1/16, 1/12, 1/8, 1/4, 1/2 , 1/1. -All samplings are kept when turned off. No loading times! -Total recording time: 10 minutes mono. -Single sampling max length: 10 minutes. -Recording sources: Audio input, audio output, USB import of .wav files. -4 types: Valve, Sine, Fuzz, Soft. -8 types: Lpf, Bpf, Bp8, hpf, Add, Bef, Bass, LoFi. -Adjustable cutoff frequency and resonance. -3 unique filter adjust parameters, that alters the filter response, and makes it possible to create unique filter types. -Can be placed after the audio input, the sampler, or inside the granular effect. -Input and output: 24 bit, 44.1 KHz Cirrus Logic high end ADC/DAC. -Internal: 40 bit, 44.1 KHz. -Audio input. Can be switched between line level/Hi-Z (guitar). -9Vdc, 660mA, 2.1mm DC plug with positive middle.